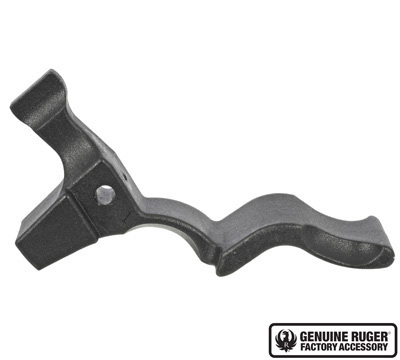 This 10/22® Extended Magazine Release is manufactured from the same rugged, heat-stabilized, glass-filled, polymer material as the trigger housing. It is compatible with all 10/22 autoloading rifle models and the Charger™ pistol. The release features ergonomic, fully ambidextrous push pockets, single finger release and flush-fit styling. Easy installation with no modification. Made in the USA. I had a competitors in metal, and the weight of the long lever was too heavy for the spring, allowing the BX-25 to drop low in position, resulting in jams and miss-feeds, as the metal lips on Ruger 10/22 magazines also double as the empty brass ejector. Went to this plastic one, with the same spring has a lot better hold on the BX-25, and it eliminated the jams and miss-feeds I had with the metal one, plus this is from Ruger so there are no fit issues. Also, the metal ones supplier would not respond to their quality issue, unlike Ruger who will work to make you happy. Yes, it is plastic, BUT it works, just as well as my plastic stock. PLEASE provide this in black and silver aluminum. The shape and size are perfect, but not crazy about plastic. Would be 5 stars if there was a silver option in metal.